The good news? Appcelerator Arrow has you covered. Whether you need data storage, APIs, push notifications, mobile analytics, or all of the above, we’ve got it. Jump into a free trial and see for yourself. 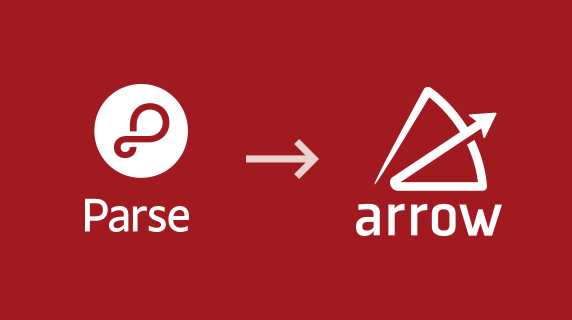 We’ll also be hosting a TechTalk (replay now available) that explains the process for moving from Parse to Arrow. For a quick start, see how simple it is to host your Parse server on Arrow Cloud. An opinionated framework for building APIs. Using Node.js, developers can connect to multiple data sources, mash them together, expose them as APIs, write business logic in between APIs, and more. An elastically scalable Node.js container stack which includes a schema-less datastore (ArrowDB) as well as full MBaaS capabilities (this part is the nearest corollary to Parse). Services built with Arrow Builder and deployed to Arrow Cloud have the benefit of a horizontally-scaled architecture, without any of the DevOps hassle. Developers can set how many containers their services should scale to, how large each container is, and the servers will scale based on the load they receive. This is in addition to full cross-platform push notifications, ArrowDB, and 20+ pre-built services such as Users, Checkins, Events, Files, and more. Push notifications: Arrow provides for full push notifications, very similar to Parse. Learn more. Mobile analytics: Again, quite similar. Parse’s ability to write simple queries on top of the analytic data is available via our custom analytics (aka “Query Builder,” which you can see here in Appcelerator Labs). Learn more. Terminology: Parse referred to data objects as Classes; we call them Custom Objects. Learn more. Access Control Levels: Arrow provides for ACLs, similar to Parse, though there are some slight differences. Learn more. User requirements: Parse can have anonymous users for almost everything; Arrow has explicit user requirements for some objects (such as photos). Client SDKs: Arrow’s client SDKs are available for Titanium, Node.js, iOS (Objective-C), and Android. These will allow you to easily connect your apps, whether built in Titanium or directly via the native SDK. Regardless of your data source, these client-side SDKs get you access to your data faster and with less code. One of the nice things about Arrow is that you can choose what you want to do. Want to manage the data yourself but need a scalable server to front the APIs? Done. Need a powerful way to quickly build new, mobile-optimized APIs? Done. Want us to manage both the data store and provide the APIs via pre-build services? Done. Terrific. What Does it Cost? Today, we bundle Arrow capabilities and capacity as part of our tiered Appcelerator Platform plans. However, we’ve also been working to introduce Arrow-only plans for greater flexibility. The new Arrow-only plans start at $20 per month and scale from there; these will soon be part of our online pricing. In the meantime, you can reach us at here to talk about pricing your specific needs. Contact us with further questions around pricing–or anything else we might help with!